We might not hear much about Gran Turismo 6 until Kazunori Yamauchi is entirely certain he's ready. Gran Turismo 5 finally made it out of the gate worldwide on November 24 or 25, depending on your region, and Polyphony Digital head Kazunori Yamauchi couldn't be happier about it. After more than 5 years of development on the game, he's realized that predicting where Gran Turismo will go in the future is just a fool's errand, so don't bother asking if you meet him at Monza. Polyphony was forced to delay Gran Turismo 5 time and time again, and Yamauchi recently told Famitsu that he's "elated we got the thing out." He said that it took so long because its development cycle "wasn't predictable" by design. "We just had to peck away at it over time, and it was rough," he added. So rough, in fact, that Yamauchi doesn't plan on making predictions or promises in regards to Gran Turismo 6 anytime soon. Famitsu asked Yamauchi if there were basic elements for the game already swimming around in his head, and he replied: "No, no. It's all in the future, so I just don't know yet." "If this was ten years ago, it'd be relatively easy for me to throw out a number like 'three years from now,' but it's pretty well impossible for me to make predictions like that now," Yamauchi continued. "Even if I told you 'the next game's going to be like this,' it could be something totally different in three years' time. It's too hard to make predictions any longer, and I have to deal with that as I tackle the next project." For now, Polyphony is focusing on releasing updates for Gran Turismo 5, fixing bugs, and creating online events. 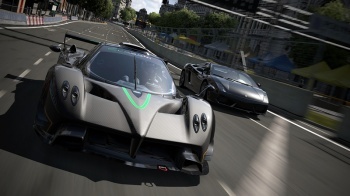 You'd think that a big DLC push would would go towards downloadable cars, but Yamauchi calls new vehicles "very hard work," so they might not be regular releases. With over 1,000 cars, 71 tracks, and a multitude of different modes, I'm wondering if we even need a Gran Turismo 6, or if DLC can just fill in the gaps. Gran Turismo 5 is such a massive game, I feel like Polyphony deserves to take a few years off.